I love coral. Coral-coral. Orange coral. Pinky coral. Peachy coral. Reddish coral. Coral just calls to me. When I heard that the Pantone Color of the Year was going to be Living Coral, I squealed. 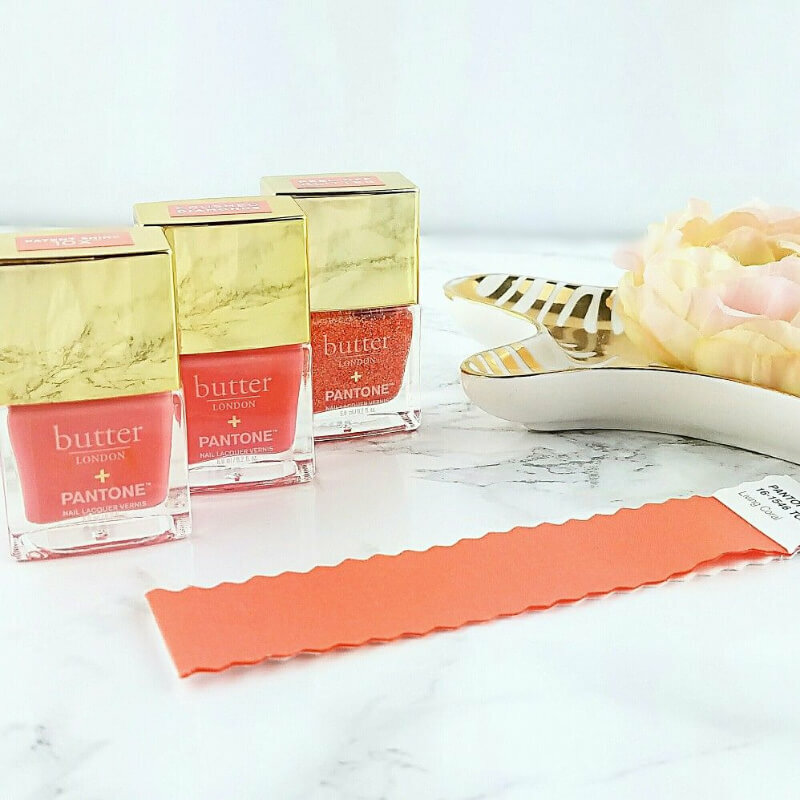 And, when this new Butter London X Pantone Color of the Year Living Coral Nail Lacquer Collection landed on my doorstep, I ripped open the box and did a happy dance. Gentle reader, I feel as if this little nail lacquer trio was created just for me. Ahh... Just look at them! 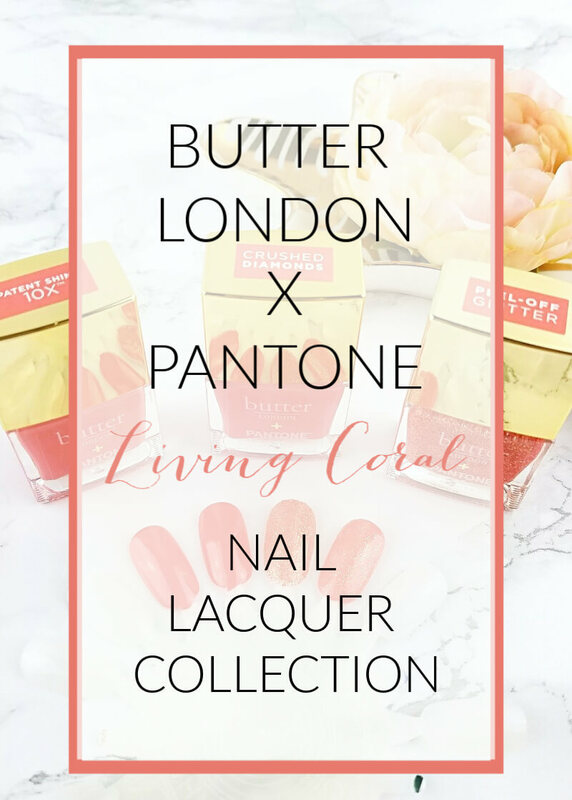 The Butter London X Pantone Color of the Year Living Coral Nail Lacquer Collection is such a special treat. These three little bottles of bright, juicy, orangy coral goodness is, in my opinion the perfect summer nail polish shade but I am not hesitating to wear it now. I don't know about you but I needed a little something fun, warm and happy on my nails to help chase away my winter doldrums and these nail lacquers are doing the job, quite nicely. Butter London X Pantone Color of the Year 2019 Living Coral Patent Shine 10X Nail Lacquer, $12.00 - Online Only. This is a rich, saturated, juicy orange coral creme. The formula is smooth and silky, application is easy if a tiny bit streaky on the first coat. I need three thin coats for an even, opaque finish. 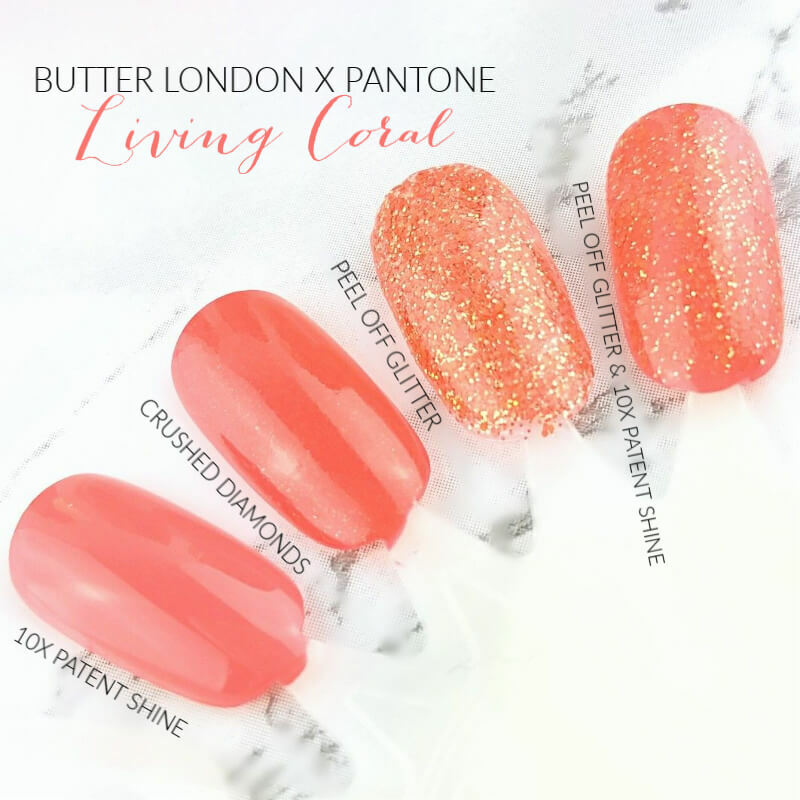 Butter London X Pantone Color of the Year 2019 Living Coral Patent Shine 10X Shimmer Nail Lacquer Crushed Diamonds $12.00 - Online Only. A warm orangy coral jelly with a beautiful, fiery golden shimmer. A shimmer that, while apparent in the bottle, is much more subtle on the nails. I can see it and it's beautiful in bright light and direct sun but it tends to hide, otherwise. This lacquer is opaque in three easy coats. 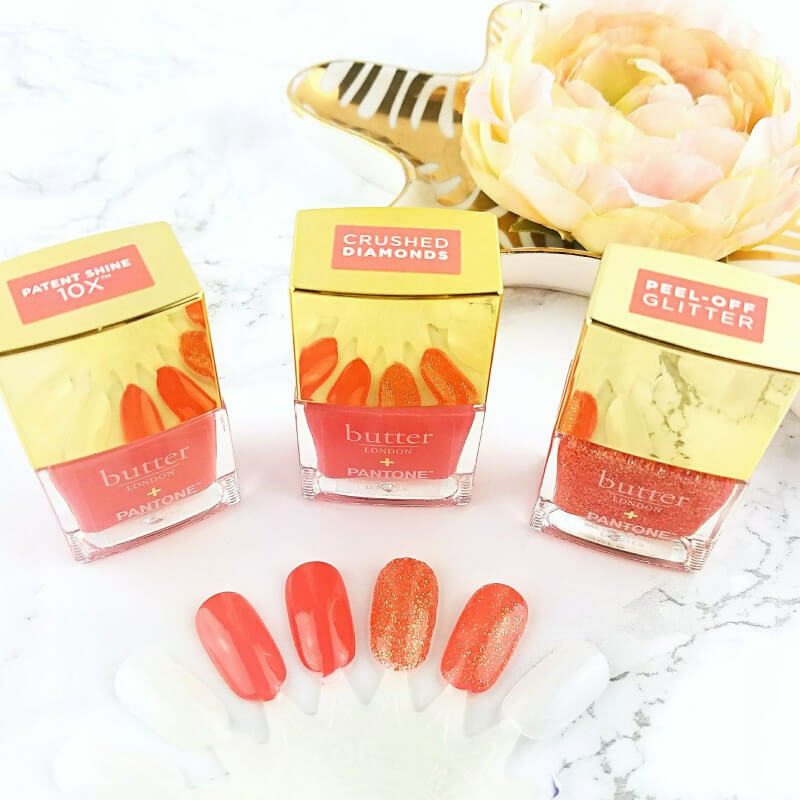 Butter London X Pantone Color of the Year 2019 Living Coral Glazen Peel Off Glitter Nail Lacquer $12.00. I love glitter and I really love a glitter that doesn't require me to soak it off in a foil wrapped bath of acetone and cotton. In a clear base swims various matte Living Coral pieces mixed with tiny gold, colour sparking micro glitters. This is such a pretty glitter! Application isn't difficult but building it to full on opacity is a multi coat proposition. I can get it nearly opaque with just a few spots that show light through in three or four coats. This glitter doesn't take a long time to dry and topping it with Seche Vite Dry Fast Top Coat speeds that process up. Where this glitter really shines, if you ask me is as a topper. Wear time on these polishes isn't super stellar but then, my nails have never been willing to wear any polish for long. Just inhospitable, I guess. I get two to three days on the lacquers, one day-ish with the peel off glitter. The glitter removes easily, when I'm ready to take it off. I just lotion or oil up my nails and cuticles then, with the rubber tip of my cuticle pusher gently wedge it up under the edge of the polish on one side of my nail and push and the glitter pops and peels off without any drama or damage. Wear time on the glitter is better, when I layer it over a regular polish. Worn alone, the peel off glitter is nice for a day or for a party but don't ask it to last much longer than that. Would you like to see swatches? I know that I normally swatch on my nails but they are "going through a thing," they are "having issues" and they just can't, right now. Trust me, I'm rolling my eyes just as hard as you are. So, a nail wheel it is. Above, you can see the three lacquers swatched on their own and I did one of the 10X Patent Shine topped with the Peel off Glitter. All swatches are topped with Seche Vite. Aren't they pretty? 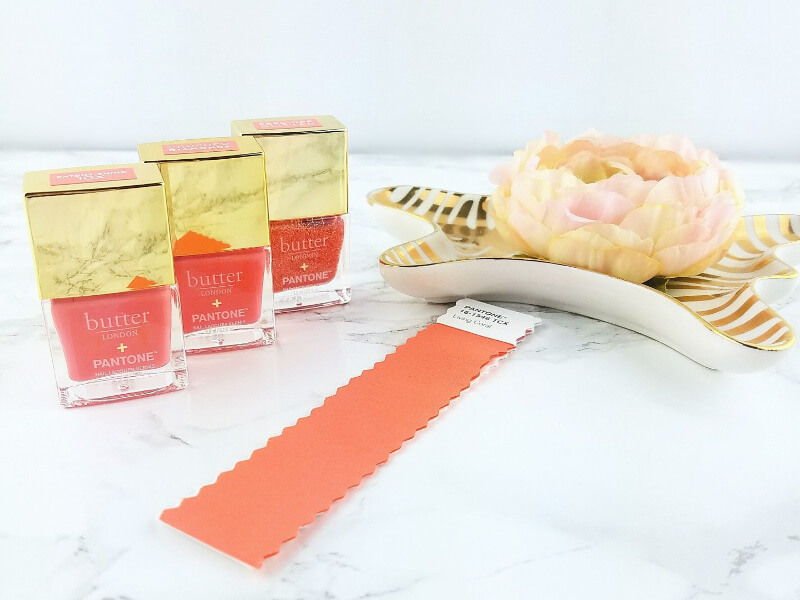 You can pick up the Butter London X Pantone Color of the Year 2019 Living Coral Nail Lacquer Collection from Ulta Beauty. Butter London is cruelty free -source My Beauty Bunny Blog, my gold standard for cruelty free beauty information- and 8 Free. Butter London does not add formaldehyde, formaldehyde resin, DBP, toluene, camphor, ethyl tosylamide, xylene or TPHP to any of it's nail formulas. Do you love coral as much as I do? Are you looking forward to celebrating this beautiful Color of the Year with these delicious and fun nail lacquers? Please, do tell. Please share the Pinterest 💖 love. Click the red Pinterest button to your left and find the special Pinterest image with the text overlay and Pin It. Thank you! I died when I opened the box. Three perfect coral nail lacquers. *sigh You need at least one. I don't mind the swatch wheel because I don't judge polishes on people for wear time... Our body chemistries are all so different! I can't deal with peel off glitter (texture thing) but the crushed diamonds looks great! I forgot how much I love butter London's clean designs! These are gorgeous shades! I'd have to say the 10x the shine and the Crushed Diamond are my favorite finish BUT I'm loving how you layered the glitter over the 10x the shine!! I am living for Living Coral and you need these polishes. I think that a more red coral would suit you right down to the ground. I love a good coral!!! Girl. Aren't they they best? What gorgeous nail polishes that perfectly embody the Pantone color of the year! These corals are juicy and delicious! I want them all! I adore coral polishes, especially on my toes! These are perfect for Pantone. What gorgeous shades. I think I would love the Shine formula since it's a softer coral. BL lasts a full week on me. I adore coral especially in nail polish! This line up is so pretty! I have a friend that loves coral nail polish so I will have to add this to my Christmas shopping list, I am starting early this year. I love that this is the color of the year! Altho I will say I feel these pull more orange! I love the colour so much, although I do wish the shimmer was more obvious in crushed diamonds. It's still really pretty! Coral isn't a favorite of mine, but these are lovely all the same! I AM LOVING the peel off glitter!